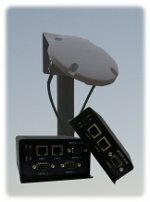 The Cybertec Series 9000 Satellite modem/router utilises the Thuraya satellite network. The larger coverage area provided by a satellite network make the Series 9000 an ideal product for remote applications where a 3G network may not be available. Like the other Cybertec products, the Series 9000 has been designed for industrial & commercial use. Access to the Thuraya Satellite service is also available from Optus Telecommunications. Thuraya is a world leading mobile satellite operator, providing its cutting-edge services in around 170 countries in Asia, Africa, Europe and the Middle East. Services provided by Thuraya include mobile voice, broadband, maritime, rural telephony, fleet management and other advanced applications that enable people and businesses everywhere under its coverage to enjoy constant access to communications and information.